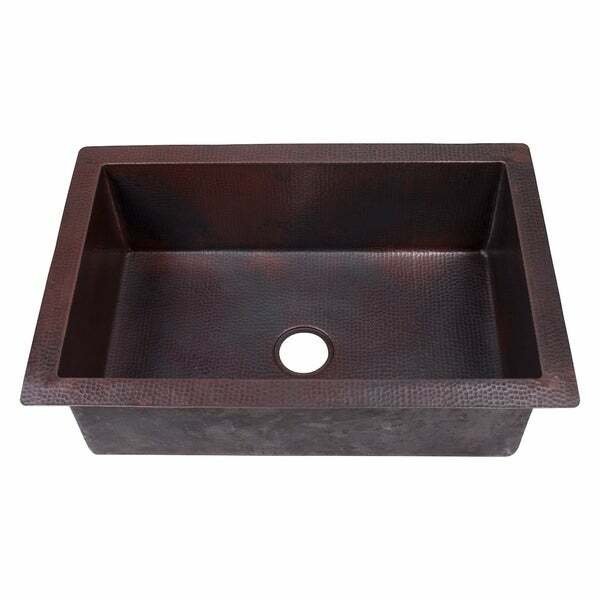 Inspire a striking, artisanal atmosphere with this stunning copper sink. The large basin provides ample space, and a hammered, antique finish creates classic appeal. This elegant piece features a standard drain fitting for convenient installation. "Width declaration confusing. What is the Overall width (left to right) and the bowl width (left to right). On the right description reads: Dimensions	10.5 in. H x 22 in. W x 33 in. L On the left description reads: Width: 20 - 31""
"What gauge is this sink?" "can the drain hole be changed before shipment to the right hand part of the sink?" Unfortunately, this item is only available as pictured (center hole).